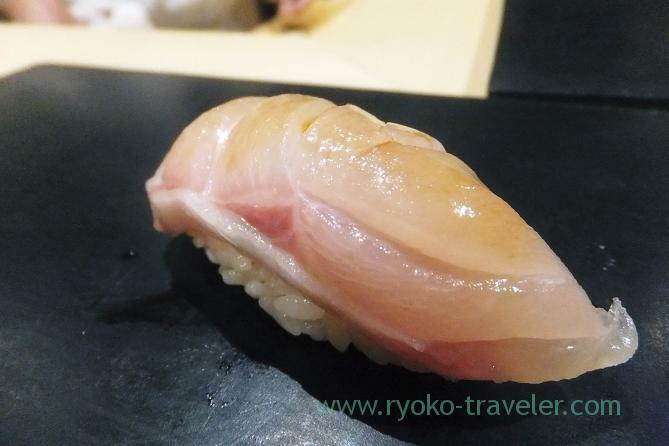 We heard a sushi chef who trained at Miyakozushi has started his own restaurant in Shintomicho area, so we tried the restaurant ! 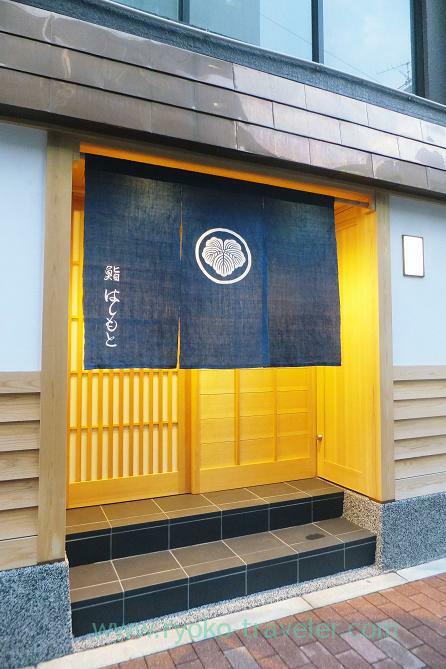 Sushi Hashimoto is located within 10 minutes walk from Shintomicho station and Hatchobori station. 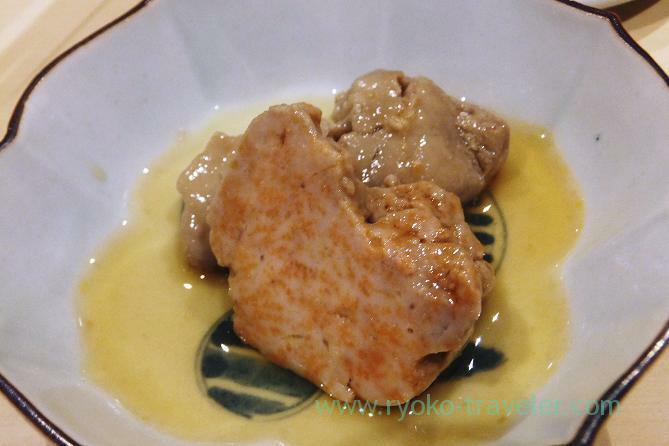 Also it is walking distance from Tsukiji and Ginza area. They are open from 5 p.m. The appearance is simple but classy. Shop curtain is the sign of opening. They hang the shop curtain at 5 p.m. in sharp. Of course, everything is still new. There are only 8 chairs along tables. Those chairs are low and wide and it’s comfortable. 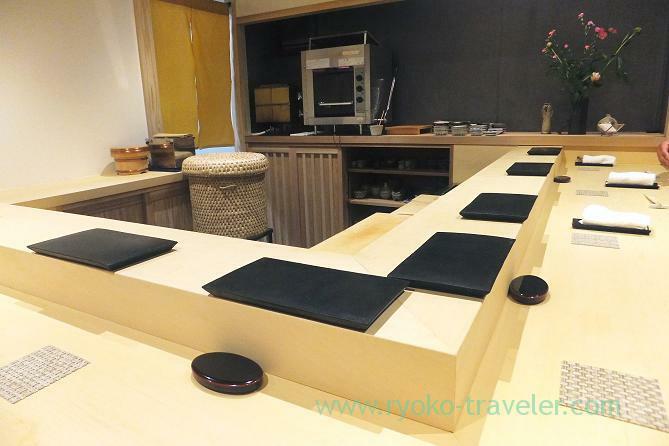 There have more casual atmosphere compared with Miyakozushi. 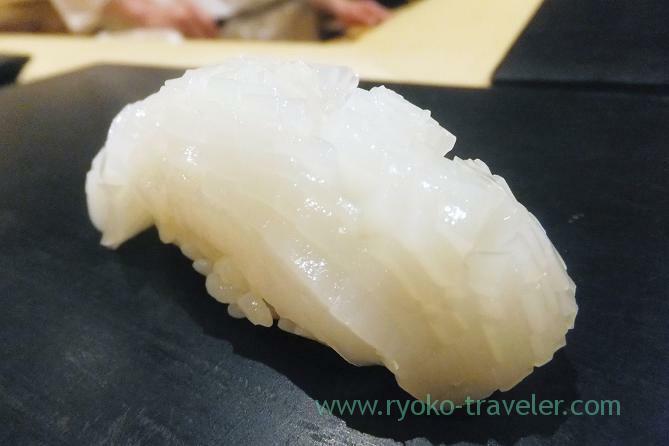 As well as system of Miyakozushi, Sushi Hashimoto serve chef’s choice that have some dishes (sashimi, grilled fish and so on) and sushi only (14000 yen , consumption tax included). If you have something hate, you’d better tell the chef in advance. He will change your food to something else. As soon as we were seated, a man gave us hand towel and asked us about our drinks. And he handed out tenugui to ladies (for using as rug). 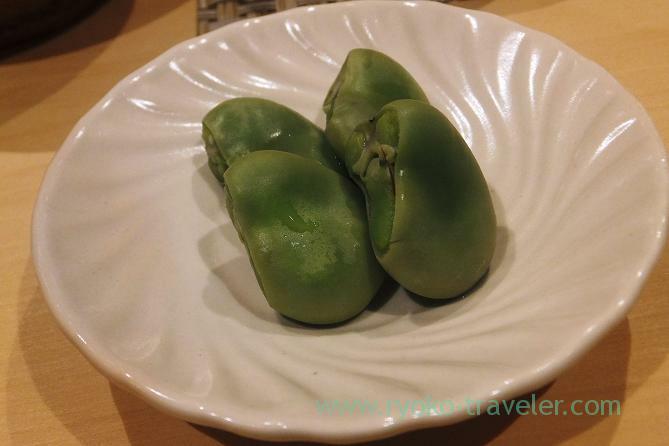 At first, I didn’t think I need alcoholic drinks, but this green beans made me feel like drinking some Japanese sake all the same and I ordered something Japanese sake that they recommend. They have various kinds of Japanese sake in stock. But they don’t prepare list for guests. But they choose one from them if you say to them what kind, tastes of Japanese sake you want. Light, heavy, flavorful and so on. 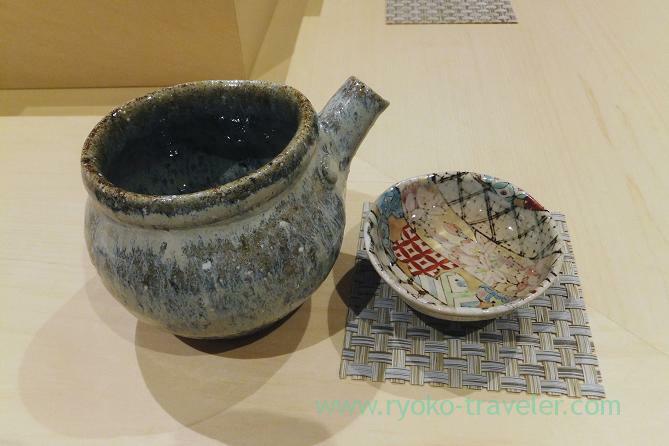 Soku is Junmaisyu (純米酒) from Fushimi of Kyoto. 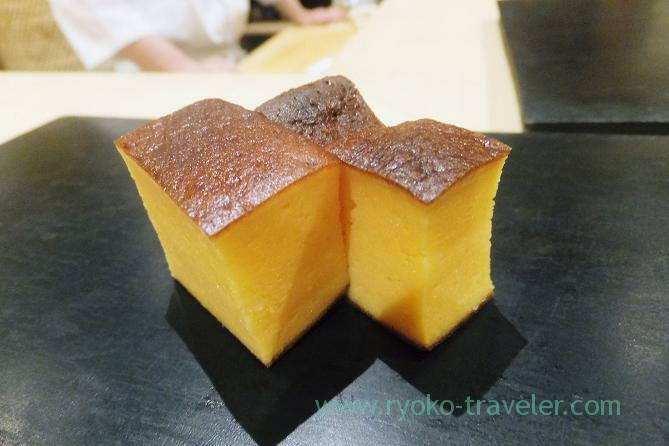 Junmaisyu is made without added alcohol and sugar. (純=pure 米=rice 酒=sake). It had clear taste and easy to drink. These cups are nice. They have various cups. This marbled sole was killed early in that morning. It was fresh, but had sticky texture and tasted good. 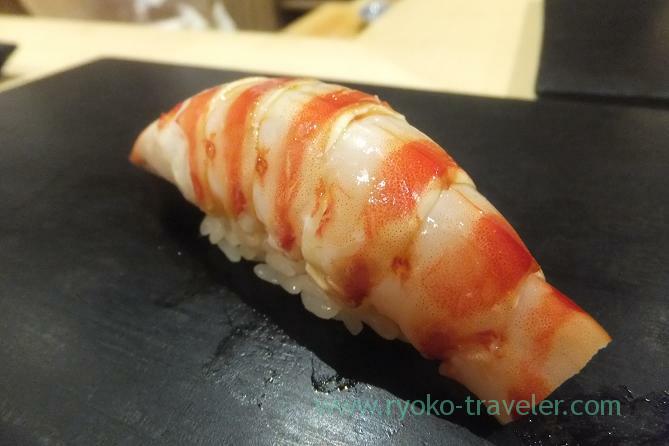 They prepare it with salt, soy sauce and wasabi. 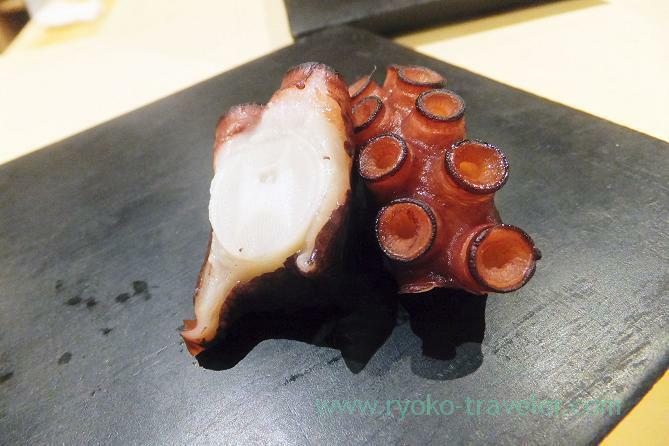 I ate one with salt and another with soy sauce and wasabi. Both was good. 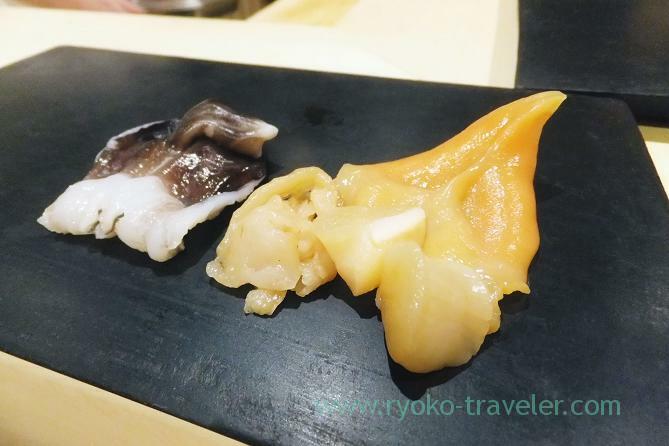 Hen clam was from Notsuke, heart clam was from Aichi. The heart clam is baked just a little and this act diminished the fishy smell. 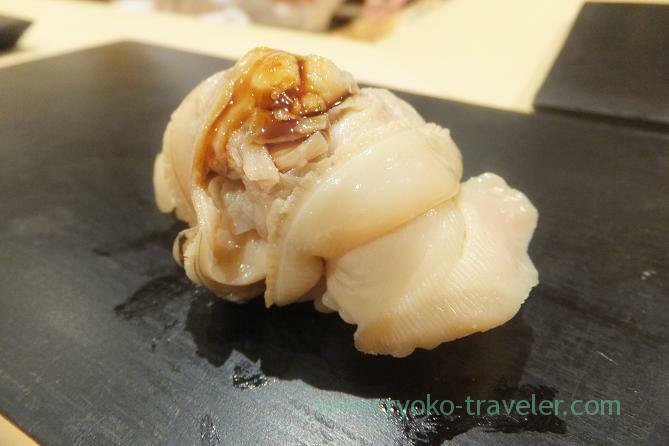 I hadn’t eaten good heart clam ever, but this heart clam was sweet and perfect ! It wasn’t too sweet and it went with Japanese sake well ! So much small sakura shrimps ! 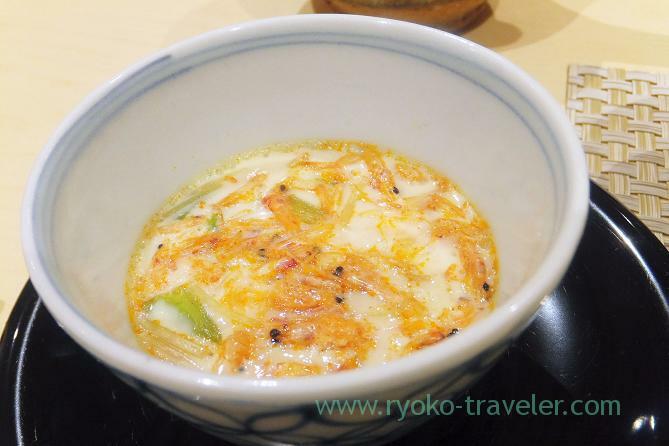 Those shrimps were crisp and the chawanmushi was soft like pudding ! And the sign of starting sushi time has appeared. And also hand towel was served again. It’s because there’re many people who eat sushi without using chopsticks. Me, too. First, Young punctatus (Kohada, コハダ) was served. 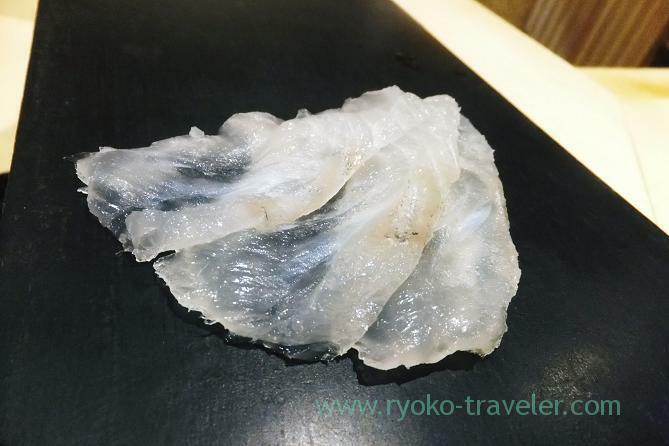 As you see, gizzard shad have shiny skin and is the original Edo-style sushi ingredients as well as conger eel. 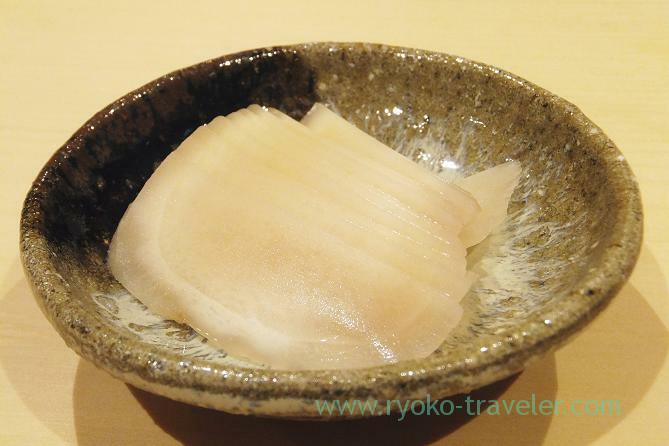 This was from Amakusa of Kumamoto and cured with salt for four days and then lightly vinegared. 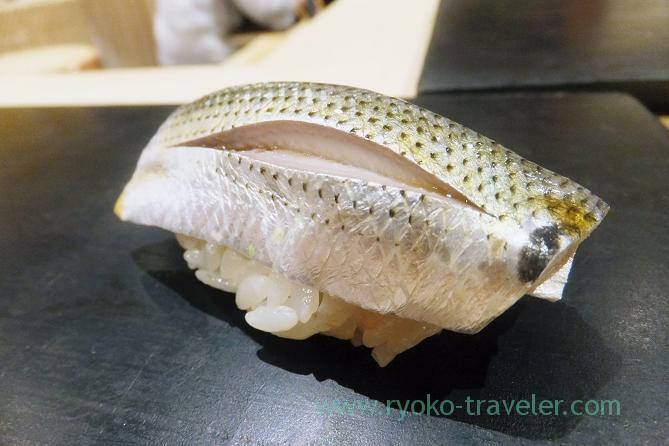 It is said that Young punctatus is the benchmark of the quality of Edo-style sushi restaurants. 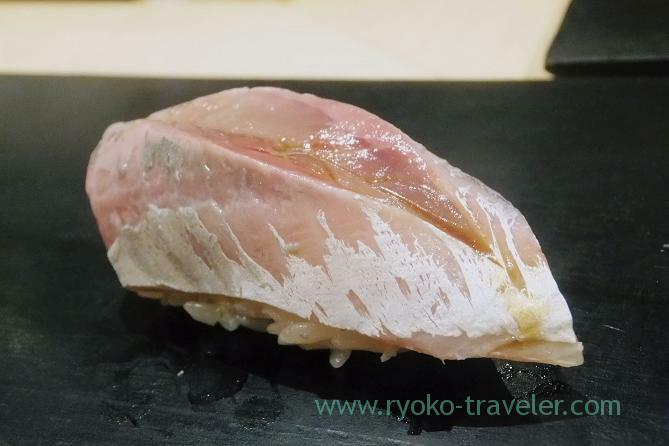 Three-days-aged red sea bream from Katsuura of Chiba. It is a body part. From Kozushima island. It was aged for one week. 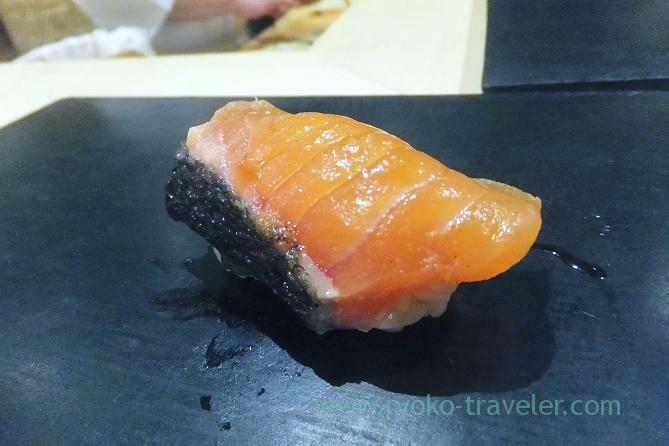 Tokishirazu is a kind of salmon and known as luxury fish caught in Hokkaido area from Spring to Summer. It was grilled in a straw and smelled good. Plenty of fat flew. From Sado of Niigata. It is a part of 70kg tuna caught in a net ! 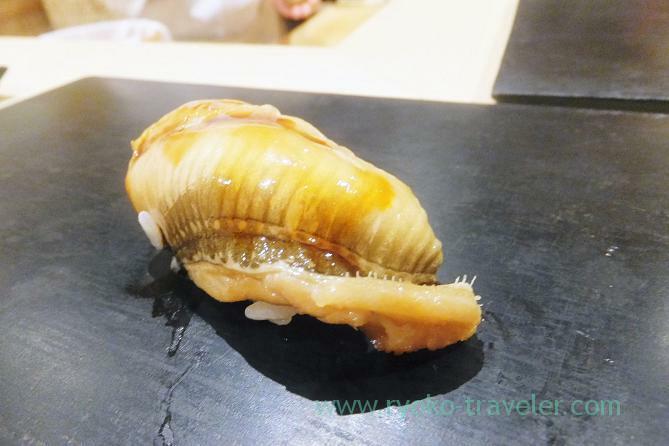 I was really impressed by the taste of this clam. 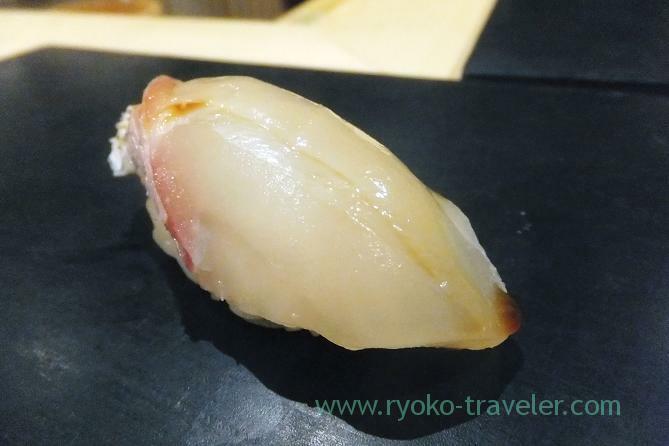 I didn’t like “boiled” clam sushi until that time. But this clam changed my mind ! So sweet and soft. I wanted to keep chewing it. From Kagoshima. Only this prawn made me disappointed at this dinner. The vinegared rice diminished the taste of shrimp. The chef said our course only have conger eel, sea urchin, tamagoyaki and soup left. The chef asked us if we need another sushi before that, so I ordered my delight ! And we backed to our course. 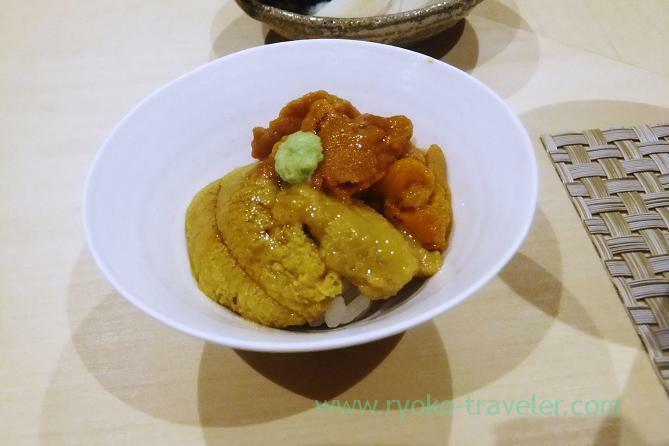 Each kinds of sea urchins from Aomori.Very very small bowl… It was perfect sushi ! 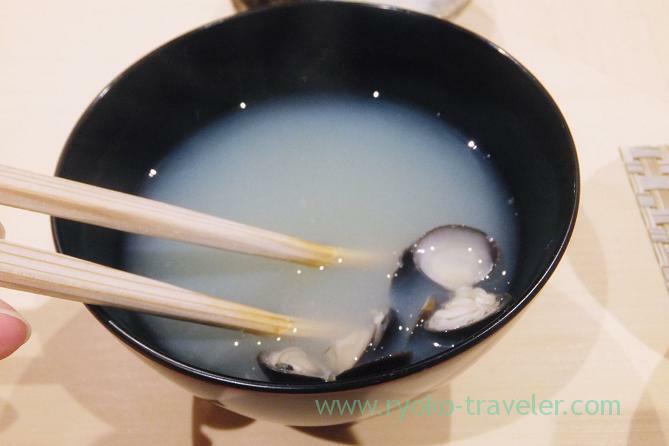 I love sea urchin and I was really happy that my mouth was full with sea urchin ! 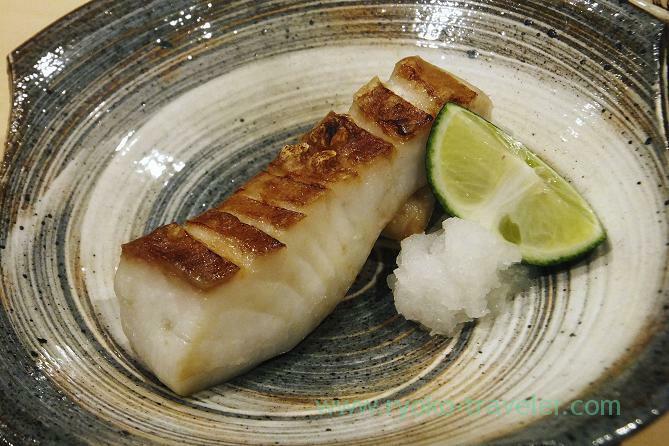 The conger eel boiled softly…. Hashimoto serve shijimi clam soup, not asari clam soup.This was good, too. Totally, I was very satisfied with the course. The skill of the chef was far better than expected. I think the restaurant’ll going to get as good reputation as Miyakozushi having now. We already took a reservation next month. He said now it is still easy to reserve if you take a reservation before one week or so. 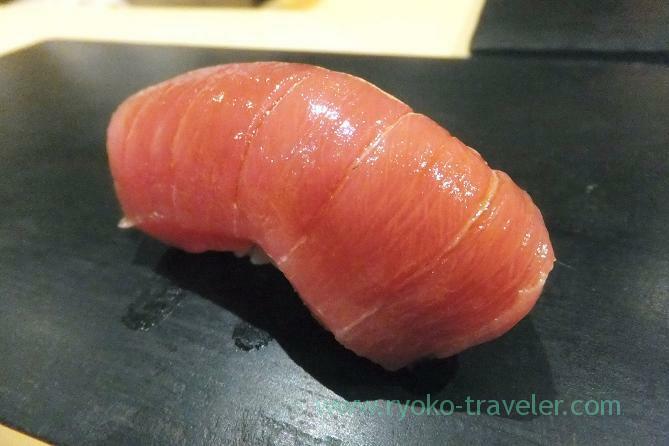 Thank you for visitting my blog and gave me much ‘like’ :-> Especially Sushi hashimoto is my delight sushi restaurant now !